Welcome to our home by the sea. 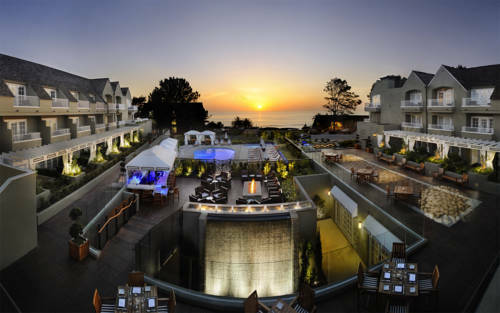 Near the shores of the Pacific Ocean the timeless L Auberge Del Mar redefines the California coastal resort experience celebrating the special connection we all have with the tranquility comfort and relaxation of the sea. Prepare to be enchanted by a seaside escape far from everyday life a sophisticated estate you can call your own. Leave the ordinary behind and escape to a picture-perfect getaway offering a refreshing residential experience with all the comforts of home. The embodiment of beachside chic L Auberge Del Mars intimate accommodations pamper you with a distinct mix of style and purpose. Designed by Newport Beachs Barclay Butera each of our 120 guest rooms and eight luxurious suites have a fresh sophisticated design as well as the latest in technological advancements and personal amenities. Most rooms open out to private balconies and cabana inspired patios with village or ocean views. Managed by Destination Hotels and Resorts Inc L Auberge Del Mar is located at 1540 Camino Del Mar at 15th Street in Del Mar California. For information or reservations call 858-259-1515 or visit www.laubergedelmar.com. Coastline: With ocean breezes and amazing views of the Pacific Coastline Restaurant serves up local favorites with a twist. Kitchen 1540: Our signature restaurant highlights the feel and flavors of our Southern California roots.